During June-July 2016, as part of the Australian Ambassadors Project, Mark White, Producer of “The Rise of the Eco Warriors,” supported by Judy Shelley, National Coordinator of AIAA, was invited to tour Indonesia by Ade Zuchri National President of the Indonesian Green Union. 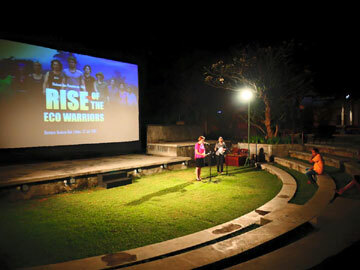 Mark toured from Jakarta to West Java, Sumatra and Kalimantan, presenting film screenings and Q and A sessions with Universities and venues to share the message of orangutan rescue and deforestation in Indonesia. He then travelled to Bali with Ade Zuchri to participate in the First Australia Indonesia Forum held in Klungkung and joined the other Australian Ambassadors Rendra Freestone, Kerensa Dewantoro and Carmencita Palermo and with AIAA support held further film screening and presentations at Bentara Budaya Denpasar, Made Budhiana Studio, Casa Luna Restaurant Ubud and the Institute of Art in Denpasar.